I spent a good part of last weekend playing with my new overlocker (serger). I had a quick lesson in the basics (threading and few of the stitches) when I picked it up, but I'm still learning. I got a couple of free lessons included with the purchase of my overlocker, but I don't have a lesson booked for a couple of weeks, so in the meantime I'm teaching myself/fumbling along. I had been scared of sewing knits up until now, as I always ended up with wavy seams when I used my ordinary (but quite old) sewing machine. But the overlocker makes it so easy to do side-seams in one go. And the differential feed means the seams are flat and not wavy! Hallelujah - a whole new world of sewing knits has been opened up for me. I used some fine merino knit that I picked up from Fabric Warehouse for $18 a metre. I think I used about a metre of fabric in total. I cut the pattern off an existing merino top. Around the neck I used some stretchy binding that is made specifically for knits. The lady in the Fabric Warehouse assured me that it was easy to use, but I had trouble getting it to sit properly on the hem and sleeves and ended up unpicking it and adding bands instead. For some reason the binding looked much better on the neck. Next time I might try and experiment with hemming the bottom seam on my sewing machine. The fit is pretty good, given that I am no pattern-making expert. It fits a smidgen more snugly than I wanted however, because I made the fatal error of forgetting to include the width of the overlocker hem (7mm) in my calculations, so I added a 12mm seam allowance and then cut all of it off when I did the seams (I should have only cut off 5mm). Whoops. But it still fits at least, and I needed a fitted warm top to wear under short-sleeved tops anyway (I like how I can justify my stuff-up!). I can see myself making a few merino tops; maybe a wrap cardigan style (an adult-sized long-sleeved version of this from Tiny Happy perhaps) or adding some embellishments, like a freezer paper stencil (I really like this one that Jessicah at Spinning a Yarn made). 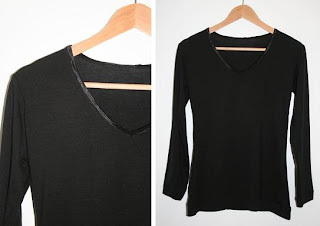 In addition to the merino top, I also had a practice at re-styling some baggy tshirts to make them more fitted. Also a lot of fun, but more on that later. A couple of people have asked me about the stretchy binding I used. It is called Foldover Elastic Binding. It's about an inch wide with a thin piece along the middle that allows you to fold it in half easily. One side is matte, the other side is shiny. It is the same stuff that is used to bind the necks of some merino tops you can buy from places like Max. From some google searches, it looks like the same stuff is often used on home-made cloth nappies to bind the legs. I had trouble getting the seam to lay flat. I was applying the binding in one step with a straight stitch, catching the front and back at the same time and using lots of pins - I think I was stretching the seam too much as I sewed. I have since found some tutorials online that say to apply the binding to the back using a zigzag first and then fold it in half and straight stitch the top. That might give a better finish - I will do some experimenting. good work on the top- it looks lovely. I would love to know more about that stretchy binding and how you used it. I usually finish my hems and neckline using bands too. Well done!! It looks great. I still don't know how to use my overlocker properly and the man at the sewing store looks at me like I'm an eedjit every time I ask a question. Just for those lazy types - www.greenbeans.co.nz is a mail service sewing place for cloth nappies etc which sells FOE (foldover elastic) :) - the lady who runs is is faaaaaabulous. land sakes, and I thought wavy knits were just my problem!